Vantage® VNX systems are pre-engineered and specifically designed to meet the demands of the power, microelectronics and general industry customer. Vantage® VNX systems are pre-engineered and specifically designed to meet the demands of the power, microelectronics and general industry customer. Standard VNX systems come in flow rates ranging from 100gpm to 600gpm nominal (22.7 to 136.3 m3/hr), combining multiple Ionpure® VNX modules on a frame with power supplies, controllers, piping, sample valves, cleaning connections, and pressure, flow and quality monitoring instrumentation. 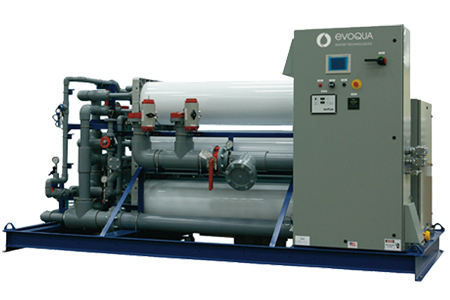 Continuous electrodeionization is a safe, chemicalfree way to take RO (reverse osmosis) water to a higher level of purity. VNX systems use our proven, proprietary process to continuously produce an uninterrupted supply of high purity water, up to 18 megohm-cm, without the need for regeneration chemicals or deionization (DI) tanks. Vantage® VNX systems are available in three trim packaged models: Plus, Deluxe, and Select. Each trim package comes standard with PLC and HMI (human machine interface) and both 460VAC and 575VAC, 3PH, 60Hz. The Plus trim package features PVC piping, pressure gauges, and Signet flow and resistivity instrumentation. The Deluxe trim package features upgraded pressure, flow, and resistivity instrumentation. The Select trim package features upgraded instrumentation, 316L stainless steel piping, NEMA 3R stainless steel enclosure, and stainless steel frame.